Today is Saturday, first day of week-end. Tonight, after weeks and weeks of warm and summer time, rain fell for the first time :( So today I can't go anywhere. I hate rain, first because it's too depressive and second because it's cold. 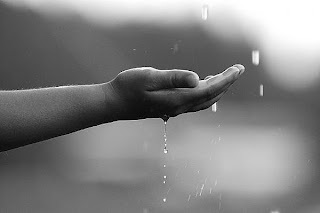 But I like smell and sound of rain, it made me think about everything. I like to sit by the window, listen to rain and just be alone. Especially if it is the night. Well, never mind that, last night I was thinking a bit. I couldn't sleep so I thought. Of course, I was thinking about D. and I realized that I care less and less about him from day to day. That's amazing, because I'm not sad and I know that our "relationship" is impossible, but still, maybe that's because I need to study more. I have one more week of school and I don't have time to think and talk about love and feelings or any other things beside school. D. has girl-friend and he looks happy. They are in relationship for one month, more or less. But as far as I know him, he's with that girl just because she's hot and he'll be more popular. He's egocentric and as one writer says: "Egoists are doomed to be miserable in love, because their love for woman is in minimum, and brutal love to him becomes irreconcilably." Something like that. Sorry, I'm translating and it isn't good, I hope that you will get the point. Then I thought about my bi-curious situation. What if I'm just jealous at D. and I only imagine that I "love him"? Like person, he's total jerk, but still I like to hang out with him and to listen to him and to talk to him, even if I'm confused when I talk to him. First he's younger than me, second I'm more mature than him, but still, now when I'm talking with him, I'm bit confused. It's smaller amount of confusion than in beginning, but still there are some dose of confusion. In the beginning I was so confused first because I didn't know him and second because I (or I think that I) love him. I can't wait the end of school, so we can hang out at the pool and we'll be together on the last week-end of June :-) I will know him better, I just know. And then in July, for 10 days we'll be together. I'd like to tell you where are we going, but, because it's great event and it's too risky, people may figure out about who I'm talking about. I know that my blog isn't popular but what if some randomly searches for that event and finds this and he/she knows me and D. Too risky! Music always was very important part of my life. I've always had a song which brought me to life, cheer me up, makes me happy, makes me crazy etc. I'll present you one song. It's from Enrique Iglesias titled "Alquien Soy Yo" or "Somebody's Me" in English. Spanish version is way better than the English one. It totally describes my situation with D.
At first I couldn't believe that there is song like that. It sounded that it was made for me. English version is totally different. Old proverb says that you are in love when every song you hear reminds you about her/him. In my case that's D. This saying is really true, because I found him in EVERY song I heard, even in Techno and House songs, only one word can make me think on him. Y en realidad, quien sabe que somos los dos. and key to my heart. I don't have other choices... ?? ?